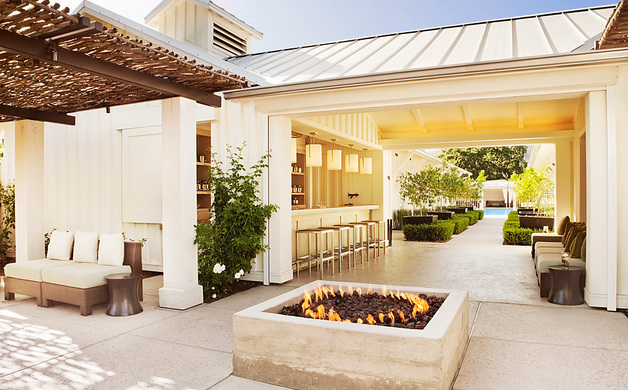 It’s easy to find your way to Calistoga’s Solage resort and spa in the northernmost corner of the Napa Valley. Just follow your nose to the scent of roses. 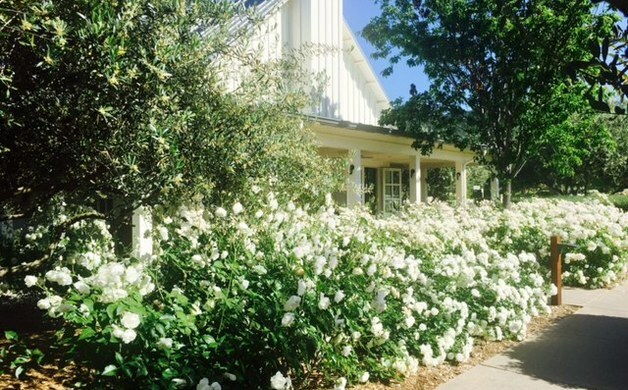 The property, along the famed Silverado Trail, is awash in thousands of white blooms, each held in check by the late spring rains. Intermingled with vibrant lavender, the resort setting – amongst vineyards and in the shadow of the Palisades mountain range – is breathtaking, and a harbinger of the serenity found within. There is no doubt upon arrival that this is a place to unwind, recalibrate, and even if just for a weekend, view the world through rose-colored glasses. Calistoga has long held its reputation as Napa Valley’s low-key destination. 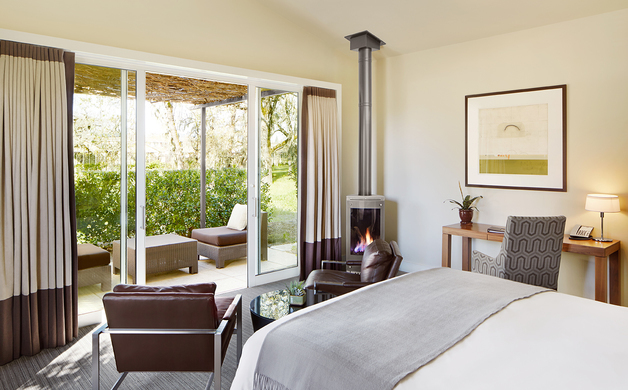 While neighboring towns have heralded their relation to the humble grape and welcomed the thirsty throngs, Calistoga has proudly retained the unofficial motto – “Relax…it’s Calistoga.” Rather than compromise the town’s maxim, the understated Solage has arguably amplified it. With its geothermal pools, yoga and wellness studio, spa offerings, and bocce courts, Solage offers possibly the best relaxation in town – and maybe the entire valley. Lodging: Each serene retreat of neutral tones features the finest linens and sumptuous robes. Some have fireplaces, and all have gracious patios with sitting areas framed by nature. Large televisions, iPod docking stations, internet access, and nightly turndown service (whereby a personal beaker of mint-leaf water and a gourmet chocolate are left bedside) complete the picture. Vaulted ceilings add spaciousness, and large bathrooms feature rainfall showers. But you’ll be tempted to take a bath in the large soaking tub, if only to utilize the provided fizzer bath tablet. Nespresso coffee makers and a selection of waters and sodas are at the ready. 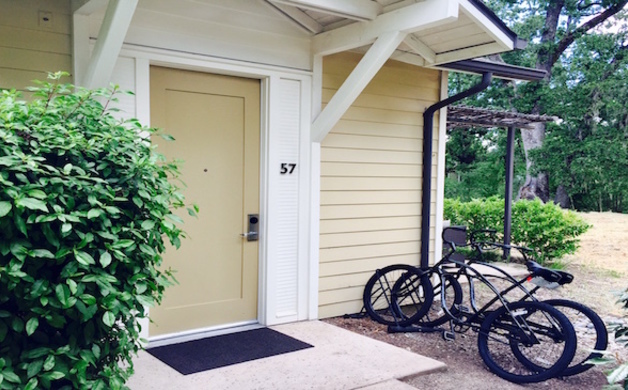 And don’t forget the bikes – two very easy-to-ride black cruisers for complimentary use during your stay. Sustenance: The resort’s urbane Michelin-starred restaurant Solbar is a favorite of both hotel guests and locals. Executive Chef Massimo Falsini recently replaced Brandon Sharp in the kitchen, and is gradually making the menu his own, such as with his first course offering ‘agnolotti in carbonara,’ playfully highlighted with a quote: “Chef grew up in Trastevere, Rome…You should try this carbonara.” (Take the not-so-subtle hint; you’ll be glad you did.) 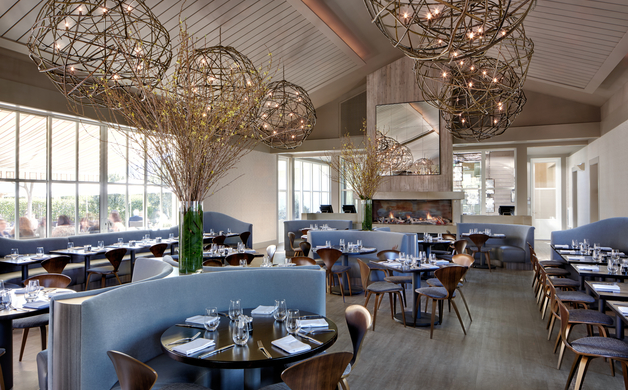 Falsini likens Napa Valley’s abundance of fresh produce to that of southern Tuscany; his dishes utilize locally sourced ingredients that celebrate the spirit of region. The entire menu is prefaced with a welcome and an assurance that healthy, lighter dishes (such as the Monterey wild salmon crudo, or strawberry gazpacho) will nourish body and soul, and hearty cuisine (i.e. Mishima Wagyu New York strip, or the seared Sakura pork chop) will comfort. Be sure to allow Solbar’s amiable sommelier and beverage manager Scott Turnbull to select perfect pairings from his immense wine list. For lighter fare, pull up a stool in the Solbar Lounge, and watch the Warriors as you dine on ‘munchies’ such as Hawaiian Ahi tuna poke, duck bahn mini, or rustic pizzas. In the morning, grab a table next to the outdoor patio’s linear fireplace and order a basket of Model Bakery (a Napa favorite) breads, or wholly original egg dishes. At each and every Solbar meal, the freshest, local, seasonal ingredients are put to creative use. Personal Maintenance: Don’t let the yoga and wellness studio - with its extensive menu of daily complimentary classes, and state-of-the-art fitness center with every conceivable piece of equipment - pressure you. If working out is your thing, Spa Solage has options. But if you prefer to simply relax, follow the proverbial rose petal strewn path to the geothermal Bathhouse pool and separate male/female clothing optional hot tubs. An olive-tree oasis, the Bathhouse is THE spot for those for whom a dip into warm mineral water is the ultimate elixir. Enhance the experience with a Spa Solage signature ‘Mudslide’ mud bath (a twist on the treatment for which Calistoga is perhaps best known). Spa Solage also offers an extensive menu of both traditional and unique treatments – each intended to promote the ultimate in wellness. And don’t forget the resort’s other pool – a Calistoga landmark that is central to the property. Olympic in size, and surrounded by palms, it’s spectacular, and the largest in Napa. Whatever your pleasure, you’ll discover that life at Solage, An Auberge Resort, is truly a bed of roses.